To order online go to: http://jsmothers.metagenics.com/store. **Receive 20% off your first online order and 10% off recurring orders. Free shipping is also available for qualifying orders. Producing short chain fatty acids and vitamins (such as biotin and vitamin K). individuals with disease are more likely to have alterations or imbalances of their gut microbiota as compared to healthy individuals. Simply put, higher diversity and optimal relative abundance patterns are associated with a more optimal state of gut health. The human gut environment is an elaborate ecosystem that includes the gut commensal microbiota, a diverse community of microorganisms that are continually interacting with each other and their human host. Research is evolving and the subject is complex, but current science suggests that individuals with disease are more likely to have alterations or imbalances of their gut microbiota as compared to healthy individuals. How are Commensal Bacteria Assessed in the Lab? The gut microbiota are primarily anaerobes, organisms only capable of surviving in an environment without oxygen. Because of this, anaerobic bacteria have been historically challenging to evaluate through culture. As a result, non-culture techniques have increasingly been used to advance the understanding of the gut ecosystem. These techniques include the use of polymerase chain reaction (PCR) amplification to identify gene sequences for specific bacterial targets. The GI Effects® Stool Profiles employs this strategy to view gut commensal microflora in a highly innovative way. What are Key Parameters of Commensal Bacteria Balance? Much of the understanding elaborated by the molecular techniques mentioned above has focused on the state of gut microbial biodiversity (the variety of bacterial genera/species found in the gut) and relative abundance (the relative quantities of each of these genera/species present in the gut). Furthermore, the 24 PCR targets on the GI Effects Stool Profiles were selected because published literature suggests that the relative abundance of these particular organisms is associated with clinical conditions relevant to our customers. 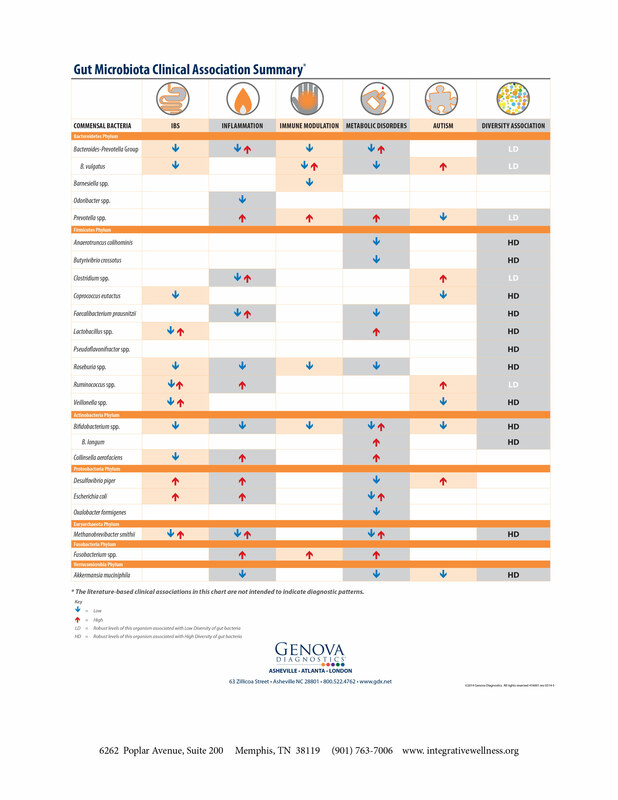 The organisms that comprise the 24 PCR targets are part of a complex microbial network with numerous interactions among each other and their host. Therefore, the primary value of Genova Diagnostic’s system biology approach to assessing the gut microbiome is in profiling clinically relevant patterns of organisms and metabolites of this community rather than focusing on the levels of any specific commensal organism. What is the Diversity Association Graphic? The Diversity Association (DA) graphic is a global biomarker of overall gut health status and serves as a proxy measure of gut biodiversity. Specifically, the Diversity Association graphic represents the results of a proprietary algorithm based on selected commensal targets that appear to correlate with gut health status. Diversity Association is graphically represented on a vertical ascending scale reflecting lower to higher overall diversity. In the gut, higher diversity is associated with gut health. There are no other commercially available measures of gut diversity. The clinical utility of the Diversity Association is based on a growing body of research demonstrating that lower gut diversity is associated with clinical disease. As such, therapeutic interventions to restore gut balance (including dietary manipulation, prebiotics and/or probiotics, as well as other clinical strategies to heal the gut) are consistent with emerging clinical science on biodiversity. What is the Relative Abundance Graphic? The relative abundance of each phylum represented in the patient’s sample is expressed as a stacked bar graphic, shown in comparison to the composite levels seen in a healthy cohort. The Relative Abundance results (combined with the Diversity Association results) serve as global markers of gut health status and microbial balance. Bacterial balance is a key factor for a healthy gut.Although research is dynamic and evolving, generalizations for a representative microbiome have been described in the literature at the phylum level. Although each individual has a unique set of bacteria,comparison of the RA at the level of the phyla for an individual against a characterized healthy cohort can support effective clinical interventions, particularly in those individuals with a pronounced imbalance. Significantly lower total RA (compared to healthy cohort) may represent gut microbiota imbalance due to low beneficial commensal organisms. Significantly higher total RA (compared to healthy cohort) may represent gut microbiota imbalance due to microbial overgrowth. What therapeutic options are appropriate when the DA and/or RA appear imbalanced? No change, which may demonstrate potentially inadequate or inappropriate interventions, requiring an adjustment in therapeutic choices.